We engaged Shin from Kimnshin for actual day wedding photography and really liked the photos that she has taken! Shin is very friendly, down to earth and is helpful in guiding us along the way. She was able to take nice and natural couple shoots for us outdoor near the venue, and is able to capture the warmth of the golden hour beautifully. She has also captured lots of memorable details, moments and people during the wedding dinner. Our friends and family like the photos too! Will definitely serves as good memory for years to come. Thank you once again!! We engaged Kim & Shin for their services several times over the last few months – family photoshoot, pre-wedding shoot, wedding day shoot and Printiculous. Each time, we enjoyed a high level of professionalism and walked away impressed and very satisfied with their level of service. As someone that has never done a photoshoot before, and not to mention that I’m terribly un-photogenic, Kim & Shin were patient with me and my wife as they guided us through different angles and poses during the pre-wedding shoot under the hot morning sun. It soon became apparent that their top priority was our satisfaction as opposed to simply “going through the motions”. We were even asked to scrutinize each set of pics after wrapping up at each location and give any feedback. They even suggested taking photos at the pier at the last minute which produced some of the best photos! We had an unforgettably enjoyable morning and more importantly, very well-taken pictures that captured us in the moment. The wedding day was no different. That they were experienced wedding photographers made the day much smoother as we picked their brains throughout our wedding planning on what might work. They maintained a good level of energy throughout the day and personally I think that’s important for wedding photographers because the couple is able to “feed off” that energy and it just makes for better pictures. One thing that we did not expect was their level of service. 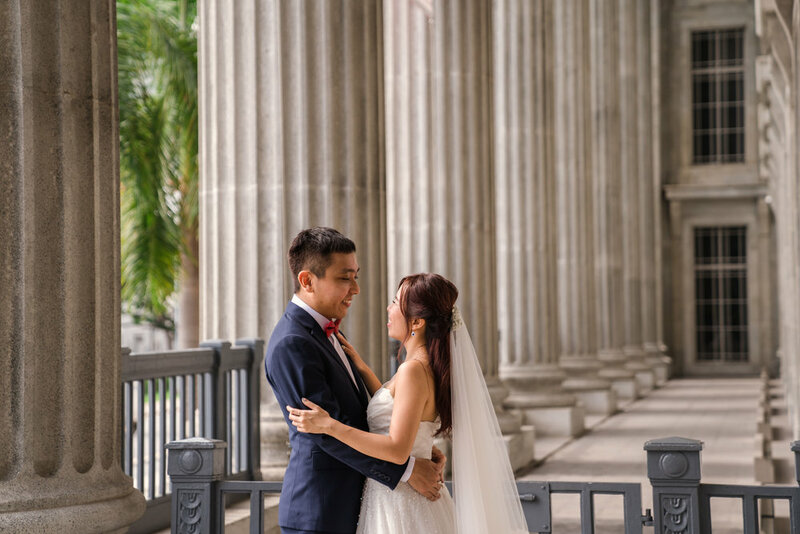 On both our pre-wedding shoot and wedding day, we slightly overran the budgeted time but Kim & Shin were still extremely professional about it and continued shooting to ensure we obtained our full set of pictures. They also seem to place importance on the finer details (thoughtful printiculous logo, acrylic thumbdrive, etc) and, to us, that’s just icing on the cake. We would like to thank them once again for helping us to make the last few months leading up to the wedding day a success, and would highly recommend their photography services for all occasions! My husband and I decided to engage Kimnshin’s services for our pre and actual wedding day photography. Kim was patient and helpful in guiding and helping us to come into a decision that we were both happy with. Both of them are professional and down-to-earth at the same time. They are kind, sincere and genuine - that’s what made us feel comfortable working with them! They gave us truthful advice on what wedding couples went through, which were incredibly helpful for us. We are pleased with the photos and for the friendship that is forged along the way. Thank you for capturing memories and precious moments for both of us. We appreciate the hard work, time and effort both of you had put in! Engaged Kim & Shin Photography for our Solemnization and outdoor photoshoot, process was smooth everything taken care of. Very pleased with the photos and lighting capturing the happy faces, mood and the moment for our Solemnization. Love the effects of outdoor photoshoot at as well ! Kim manage to turn things around with the weather making us look good with the sun lit sky behind. Definitely keepsake memories in years to come. Special thanks to Kim for going the extra mile! For more reviews, visit our Facebook & Bridestory page.